Have the holiday blues? I don’t mean to bring anyone down during what is supposed to be the ‘most wonderful time of the year,’ but in reality there are many people hurting. For some, life’s tragedies happen this time of year the same as they might any other time. For others, this may have already happened, and this time of year is a permanent reminder of an unfortunate experience. There are others still who struggle with depression, anxiety and mental illness all year. The holiday season can exacerbate these feelings and may make holidays especially long, depressing and potentially dangerous times. Today’s Straight, No Chaser is not meant to drag you into the dumps but to empower you with tips to assist you in the event this is a difficult time for you. By the way, I’m extremely thankful that you’ve chosen to give me moments of your day and life. I take that gift seriously and hope you continue to find it a worthwhile use of your time. Here’s five tips to support your holiday mental health. Find support. Specifically, have ‘go-to’ friends and family that provide you comforting support. There’s a time and place for tough love, but in the midst of depression or suicidal ideation, ‘buck up’ is not good advice. Know where your support lies and be sure (in advance) that it will be accessible if you need it. Find success and happiness where it is. During the holidays, people tend to lament what isn’t. That’s not a formula for success. Yes, all of your family may not be around, but celebrating happy memories with the ones you can often fills the room with the joyous presence of loved ones not around. Enjoy the pleasures and successes you do have access to, whether big or small. Focusing on the positive keep you positive. If you’re struggling, admit it. You already know you’re hurting. Often the first step to getting past it is acknowledging it. Once done, then you can put coping mechanisms in place to address your feelings. 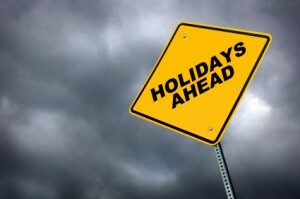 Avoid holiday activities that will create post-holiday angst. This applies to eating, drinking, shopping and personal interactions. Some use the holiday as an excuse to overindulge as if the consequences won’t be there afterwards. Reread #1 above. Know when you need professional help. If your support system doesn’t sufficiently address your needs, and you’re feeling severely depressed, can’t function or are suicidal or homicidal, find a physician or mental health professional ASAP. Of course, you can always contact your SterlingMedicalAdvice.com expert. If you type mental health, depression or other keywords into the search bar above, you can access many other Straight, No Chaser blogs on behavioral health concerns that may provide you the support you need. I wish you all the best today and throughout the year, and hopefully the picture above will reflect the only type of blues you’ll have to deal with this year.